MSME Minister meets Applicate’s Co-Founder to discuss about AI for SMEs. 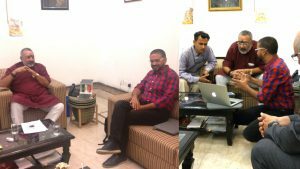 MSME Minister Mr. Giriraj Singh had invited the co-founder of Applicate, Ranjeet Kumar to explore and understand the power of future defining technologies a few weeks back. They attended a demonstration of how Drones can be used for empowering Farmers, by a NOIDA based start-up. 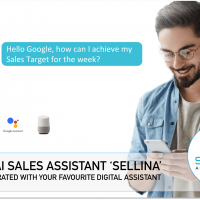 “Inspired by the passion and personal commitment of the Minister to explore new technologies, we quickly adapted our first of its kind AI Powered Platform for Sales, HR and Consumer connect to suit SMEs“ said Ranjeet Kumar. 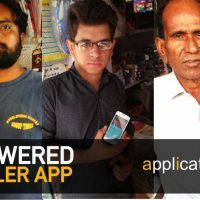 To showcase how AI can exponentially augment the capabilities of SMEs, Ranjeet Kumar met the MSME Minister at his residence and shared with him a quick demo of the AI platform developed by Applicate. Ranjeet Kumar, in discussion with the SME Minister. 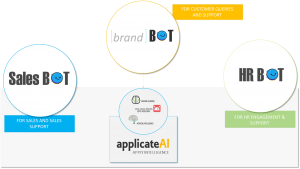 Applicate has created first of its kind Enterprise AI Assistant platform with defined and curated work-flows for Sales, Consumer Engagement and Employee support and engagement. 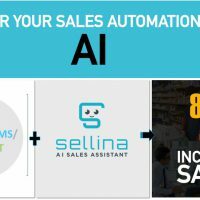 The AI Assistant Platform created by Applicate can Train, Support and Assist 1000s of employees and channel partners across functions of an organization. 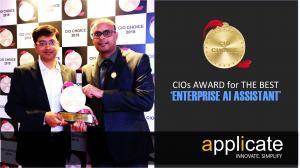 Voted as the best solution by more than 75 CIOs of top Indian and Global companies, Applicate has been awarded CIO Choice AWARD for the BEST Solution in ‘ENTERPRISE AI ASSISTANT’ category !! 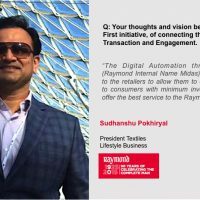 Mr. Singh was excited with the concept and was keen to understand how AI will help the Indian SMEs in leading the Fourth Industrial Revolution. Taking the discussion forward, Applicate is creating a blue print for an AI enabled SME empowerment platform which would be presented to the key stakeholders of the MSME ministry. 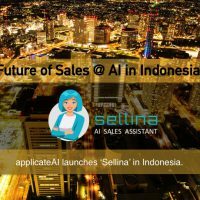 AI Platform for Sales, HR and Marketing. Inspired by the technology orientation of the Minister, Ranjeet Kumar says “I would rate his passion, keenness and commitment to new technologies far higher than many corporate CEOs. He has practically, converted his residence into a laboratory of sorts for new technologies. I could see multiple pilots of solar energy, wind energy, automated spindle and many more innovations running live at his residence”. Residence of MSME Minister turned into a laboratory of sorts for new technologies.